Knitalong Update: Almost a ta-dah! You'd like to see it...? ...yes, it's still blocking at the moment but I do have some sneak pictures for you, taken yesterday morning before the ends were sewn in and when my model was still in her PJs. 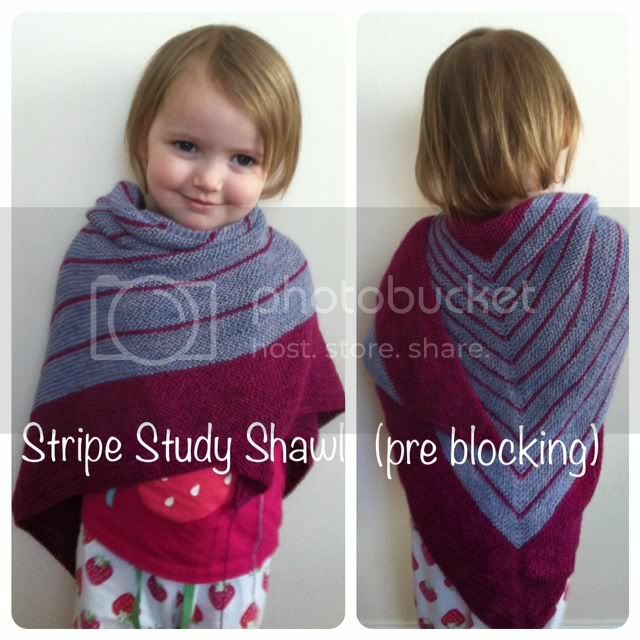 If you haven't seen them, there are already a few other completed shawls (here... and here?) and there is a link over at Natalie's blog where you can add your progress too. Natalie's shawl is looking gorgeous - she is still wading through her border rows - I feel her pain! Despite those last few long rows, this pattern is absolutely superb. The problem I've always had with my beloved and much worn Boneyard Shawl is that when I flick one end (nonchalantly) across my front, the point ends up down my arm. The SSS solves this issue perfectly and for this reason I just know there will be more of these to come. Which I suppose leads me onto a Twitter conversation I had with some lovely friends yesterday. 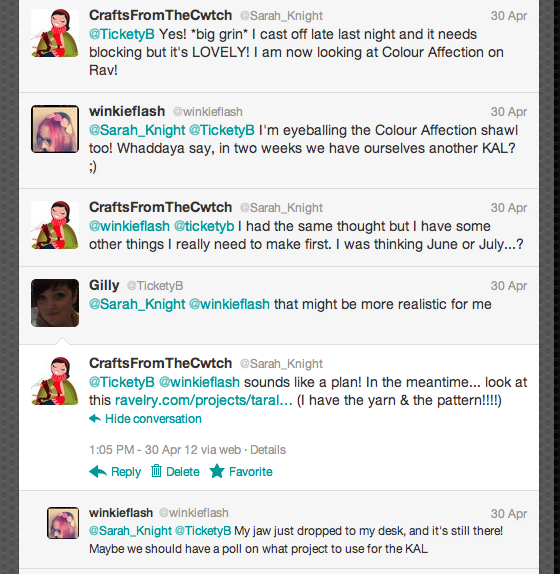 Here are the links mentioned: Colour Affection and the most stunning whippoorwill. I can't wait to see all the other shawls - please don't be shy! Feel free to link in the comments here, and to tag your pics on Instagram or Twitter using #SSSKnitalong. You can also use the CftC Facebook page to post your pics if you don't have a blog or use Instagram or Twitter. It's looking so lovely. I like the Colour Affection but for me the Whippoorwill that has the edge because I like the idea of being able to tie it. You must tell me how you did that clever screen copy thing! I'm thinking of a large one to tie as well. As for the pic, it's just a print screen - I use a mac so it's cmd+shift+4 and select the area you want to take a pic of. The shawl looks fab, I am about halfway through the border, but to be honest I think I may well cast off now, as I'm not keen on a big block of that colour (variegated) yarn at the edge.....hhhmmmmm, not sure now I've seen yours, the wide border does look good......that's the only problem with this is that you can't really get a clear picture of what it looks like while mid process. I went to wonder wool on Saturday and have bought the yarn for the colour affection, but I think as soon as the stripe is off, I will start the next.....I like the other rainbow one, very pretty! Your shawl came out awesome! The colors are so striking. ooo that is beautiful!and what an adorable model! Goodness, what a sweet little model you have! and yay again, i'd love to join your next knitalong! i voted for colour affection, because the whippoorwill one doesn't excite me at all. Wow, I can't believe how much little miss has grown, she looks so sweet! I voted for colour affection as I have others similar to the other, I'd love to join in. I'd do the whippoorwill with you although it's my first shawl so I hope it'll be easy enough. Any ideas on where to get the yarn? I like the look of 'Bugga' but I can't see who is currently retailing it. I don't know that yarn - have you googled it?